The sleep/wake cycle is controlled by reciprocal inhibition between cholinergic and aminergic cell groups in the pons and brainstem . In rapid eye movement (REM) sleep, cholinergic neurone discharge is at its highest level while aminergic discharge is at the lowest level across all behavioural states . These changes are accompanied by alteration of respiratory pattern and in the output of some respiratory motoneurone pools . While effects of aminergic receptors on respiratory pattern and motor output have been extensively investigated, less is known of the effects of cholinergic receptors. Disease syndromes such as obstructive sleep apnoea in adults or infants, or sudden infant death syndrome may involve abnormal cholinergic receptor-mediated responses. Here we report network and cellular effects of muscarinic acetylcholine receptors (mAChRs) on respiratory pattern and motor output in hypoglossal motoneurons (HMs) using in vitro slice preparations from mouse. Rhythmically active brainstem slices were made from mice (P0-4 days) and the mAChR agonist, muscarine was bath applied (10 µM, n = 6). As illustrated in Fig. 1A, integrated hypoglossal nerve (IntXIIN) burst amplitude increased by 80 ± 24% (mean ± SE) while burst frequency decreased (-34 ± 7%). 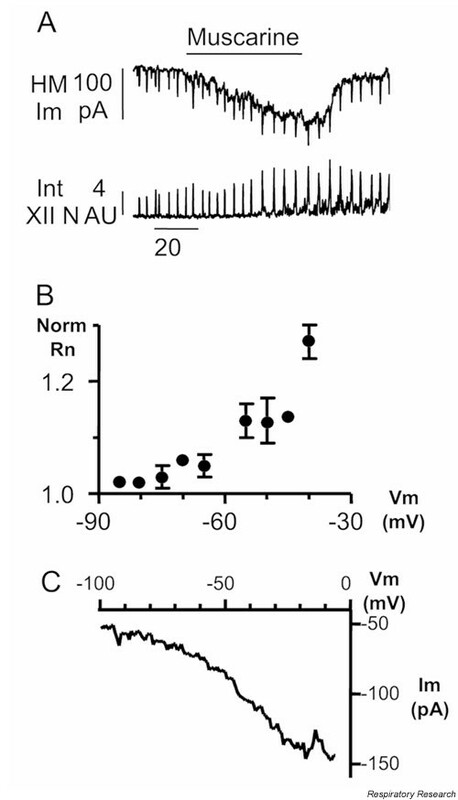 Local injection of muscarine (100 µM, n = 14) over the hypoglossal nucleus (nXII) produced an increase in IntXIIN burst amplitude (96 ± 23%) but no change in burst frequency (5 ± 4%). Injections of muscarine (n = 3) in the pre-Bötzinger complex (PBC) decreased IntXIIN burst frequency (-20 ± 5%) and increased burst amplitude (60 ± 12%). These effects were blocked by bath application of atropine (n = 3, 1 µM). In whole cell recordings from HMs (n = 14) local nXII or bath application of muscarine evoked an inward current (-29 ± 5 pA) in voltage clamp at -60 mV (see Fig. 1A for example) and depolarization in current clamp. This current was associated with increased neuronal input resistance (Rn) which was greater at voltages positive to -60 mV (Fig. 1B), suggesting that muscarine inhibited a voltage-dependent outward current. Muscarinic inhibition of K+ currents elicited by slow (2 s) depolarizing voltage ramps in the presence of TTX and Cd2+ was much greater at voltages from -70 to -20 mV (Fig. 1C), a voltage range typically occupied by the voltage- and ligand-dependent K+current IM but not by other voltage-dependent K+ currents. These results suggest that mAChRs have potent effects both on respiratory rhythm generation and HM motor output by distinct actions on both PBC neurones and HMs. We hypothesize that excitatory effects of mAChRs on HMs is partly due to muscarinic inhibition of the potassium current IM, causing depolarization and increased Rn and thus enhancing HM firing. Approved by the University of Queensland and University of Auckland Ethics Committees. Supported by ARC & Ramaciotti Foundation (MCB), Marsden Fund & HRC New Zealand (GDF).